In Salesforce Chatter Group represent a group of users. It’s a great way to boost collaboration in your organization. 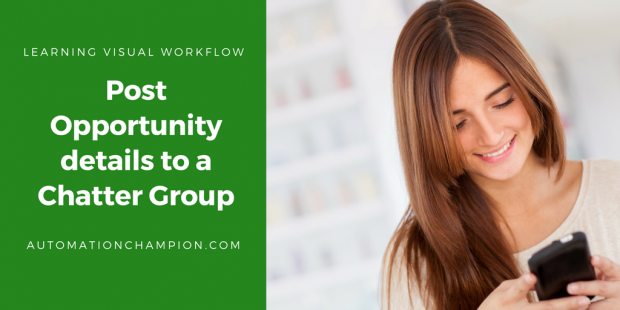 You can add unlimited members into Chatter Group, but a user can join maximum of 100 Groups. Here the user wants to post a message on Chatter Group when an Opportunity is created with an amount greater than $10000, so users don’t need to check their mailbox every time and this will provide a way to boost collaboration in organizations. Higher management in Universal Container wants to a develop an automated process, so whenever an Opportunity is created in a system with an amount greater than $10000 it will automatically post a message to Chatter Group (UC Internal Announcement). 1) Body: – This is the message that appears in the feed. 2) Linkurl: – its field contains the URL of opportunity record. 3) ParentId: – ID of the object type to which the is related. For example, set this field to a UserId to post to someone’s profile feed, or a GroupId to post to a specific Group. 4) Title: – its field contains the title of Chatter post. 5) Type: – The type of FeedItem. In our case it’s LinkPost. 6) Save the flow with the name ( Post To Chatter Group) and Close the canvas. 2) Click on Save button, navigate to Chatter Group (UC Internal Announcement) and check Group Feed. Rakesh, I really appreciate your blog. It is very insightful! Thanks. Question: with this scenario, could field data be posted to a Chatter group that includes customers? Here is the situation: my users are owners of properties in a motor home resort. They typically live hundreds or thousands of miles away. The complex is allowing the construction of small buildings called Coach Houses on the individual owner properties. The property owners need to get updates on the construction process, ask questions of board members, and collaborate with builders. To save money I’m building an EE org. 1 EE and several chatter plus licenses for board members. If necessary I’ll add more Chatter plus but I’d rather just set up a public group with customers for each property owner. They would then get a Chatter free license each. Saving the association the cost of Chatter plus licenses. If I do this, can I feed field data to the Chatter free users through their individual Chatter free public group using a Process? Property owners don’t need to see the objects. They just need to be fed their data. Can I do this? Or what would you recommend as the solution for it. I think yes, you can achieve it using Process Builder. Note:- Process builder runs in System mode. Could you share your dev org credentials where this feature is enabled(As it takes 2 weeks to enable pilot in the Dev org). This is really urgent me to test this feature. Thanks in advance. Can you provide your email where I can contact you ? ?